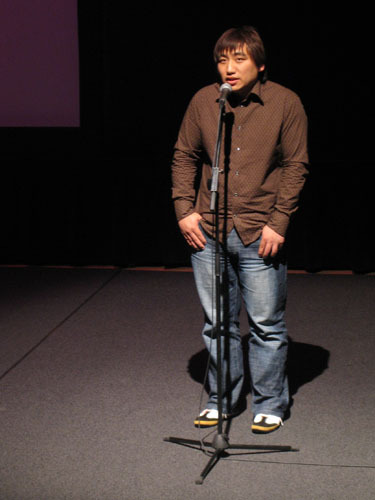 Last night, Li Zhenhua presented The Wave, a program of new experimental film and video from China. Unfortunately, very little of this work ever gets seen outside of China, and even more rarely in the US. Thus, last night presented a fantastic opportunity to see some really innovative material. Did you miss it? Normally, I would have to say touch luck, but the Open-Ended exhibition is presenting additonal opportunities to see The Wave. The program will be running continuously in the gallery through Sunday, May 7. Don’t miss it! While you’re there, be sure to take a look at Zhenhua’s Virtual China in the Open-Ended Gallery. It is installed under the stage and is available on the web. And, don’t miss Zhenhua’s Artist in residence journal, detailing one his first experiences here in the US. For a uniquely Minnesota experience, we’re going to try to get him to Nye’s tomorrow night. I imagine that will prove blogworthy as well.